The basis of any great film is a great story. “No Direction Home: Bob Dylan,” the new Martin Scorsese-directed documentary that was broadcast this week on PBS and is now available on a two-disc DVD set, is exhilarating to watch because it’s one of the great heroic stories in pop music history. Putting aside the grand statements, the film follows the story of a very young man who is committed to a course of constant artistic evolution. This commitment would continually turn friends and collaborators and even his audience against him. Boldly facing the slings and arrows, he’d continually reinvent himself. Ayn Rand would have loved it. We see a great deal of this action unfold on film. Interspersed throughout, there is footage of Dylan’s infamous 1966 world tour where a Telecaster-toting Dylan — at the very height of his popularity — musically confronts his snobby European detractors. That’s when he’s not mumbling and stumbling around the stage in a drug haze like he’s Courtney Love. But let us clarify something. “No Direction Home” is an authorized biography, and even if Dylan hasn’t seen a frame of it, this documentary is the product of years of work by his assorted handlers. This is Dylan’s version of events and even if he didn’t tell Scorsese what kind of story to tell, that’s only because Dylan is paying key people to look after his interests. Rosen reportedly conducted the interview with the reclusive Dylan himself, quizzing his employer for upwards of 10 hours. (Snippets of this interview function as the narration for the film.) As you’d expect, all these accounts conform to a common vision. It’s difficult to discern the level of editorial control that Scorsese was able to have in the documentary. He recorded no interviews beyond those provided by Rosen. And in an interview with Charlie Rose after the documentary aired, Scorsese referred to the some of the stipulations that he had to labor under as part of the deal. He said that he was told that the film had to conclude in 1966 (when Dylan had a motorcycle accident and went into semi-seclusion) and he was given access to only certain footage in Dylan’s archive. Scorsese also told Rose that he was involved in the documentary for the past three years, juggling work on two or three other movie projects while “No Direction Home” took form. How much time was Scorsese able to give this documentary? From the perspective of Dylan’s circle, concerns about the busy Scorsese being able to do is own research/interviews is of secondary importance. Scorsese’s presence is the bonus for them. It wouldn’t be out of bounds to suggest that Scorsese’s involvement gives this project an enhanced level of respectability and extra allure. This documentary is the latest step in a two-pronged strategy that aims to guide Dylan in the twilight of his career. The movie was preceded by last year’s conversational, but still elliptical memoir, “Chronicles, Vol. 1.” Both products have the same intent: to combat the sensationalistic, trash-can-searching biographies that have trailed Dylan throughout his career. The goal of this personal glasnost is a conscious and deliberate attempt by Dylan and his dependants to “set the record straight” on his remarkable life, reassure his place in pop music history while simultaneously keeping his late ’90s commercial revival going. Keeping this in mind, the film still tells a entertaining (if not a complete nor unbiased) story. Like any good PBS documentary, Scorsese has the camera scan photos or scraps of lyrics like PBS’ Ken Burns, and then mixing in the modern-day reminiscences from some of those who were there during Dylan’s metamorphosis. Ex-girlfriends like Joan Baez and Suze Rotolo still seem fond of him, Ginsberg anoints him as the successor to the Beat poets, and folkies like Van Ronk or harp player Tony Glover marvel at his unending adaptability. Dylan’s comments are fairly plainspoken and occasionally illuminating — typical statements you’d expect from rock’s great sphinx. He seemed much more relaxed than last fall’s appearance on “60 Minutes,” where he had to fend off Ed Bradley’s clumsy attempts to buddy up with him. 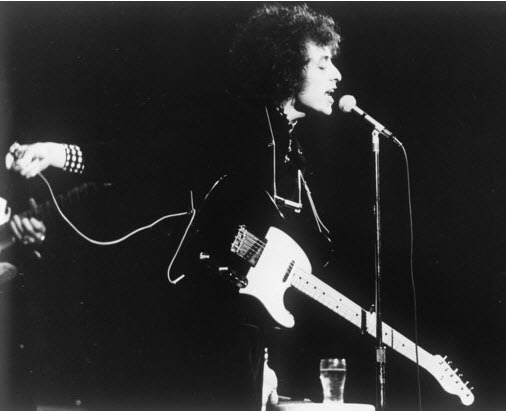 The documentary’s most thrilling moments are the segments when Dylan provokes his folk-purist audience by pulling out an electric guitar. You see black-and-white footage of Dylan’s infamous debut electric performance at the Newport Folk Festival in 1965. Braving audible boos and grumbling, Dylan plays three rag-tag songs as blues hot shot Mike Bloomfield runs wild on his guitar, playing like he’s a snake charmer. The music had the opposite effect on the crowd that day. Here we see a strung-out, afro-ed Dylan playing complete electric sets backed ferociously by the Hawks, a group of blues/R&B players who’d later gain fame as the Band. The reaction from the English audiences was even more virulent than their American counterparts. No matter that Dylan and the Hawks were drilling them with masterworks from “Highway 61 Revisited” or the soon-to-be released “Blonde On Blonde,” the catcalls and jeering just grew louder. Offstage, Dylan verbally toys with ill-prepared journalists, strains to pull an impromptu duet out of an emaciated Johnny Cash, or just rocks himself back and forth as if he was a traumatized child from a post-Cold War Eastern European orphanage. After the tour, a motorcycle crash would give Dylan the chance to escape the monumental pressure. He would erect a barrier between himself and the rest of the world. It was also time for Dylan the artist to once again reinvent himself. This time, he’d become a family man, biblical scholar, and would thoroughly explore roots music with the Band while in a self-imposed exile. It would be two years before he took the stage again and eights years before he’d go back on the road. He’d never regain the firm grasp on the Western culture that he enjoyed in the early ’60s. But, that’s another story. So, following the filmmaker’s mantra, “No Direction Home” is a great film because it really tells a fascinating story (even if it is one sided). Incidentally or not, it also follows yet another core rule of moviemaking: it begs a sequel. 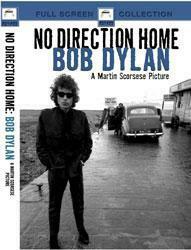 Tags: Bob Dylan, Martin Scorsese, No Direction Home, PBS, review. Bookmark the permalink.